The Hobie Heavy Duty Plug-in Kayak Cart has a much higher capacity and tires with tread that are more rugged than the standard plug-in cart or the Trax carts. The Hobie Heavy Duty Plug-in Kayak Cart's capacity far exceeds the weight of the heaviest Hobie kayaks. Tire capacity lists as over 200 lbs per tire. These tires are foam filled and standard rubber tire with deep tread pattern.The Hobie Heavy Duty Plug-in Kayak Cart is the recommended cart for the Tandem Island. Cart lasts for a year or so and it is very light, but they don't weld the cross bar good enough and it breaks. I love hobie but Ive probably gone through about 4 of these already in 7 years. Would love a better alternative. This works out perfect for me and my Outback. Most of my area's are dirt till I get right down on to the beach, and even then it works great on that short stent of beach area. If it was going to be a long pull on the sand, then I would definitely recommend the other tires specially for just sand. But for me, these work out just great for me. And ACK was quick to ship and I received it within days of ordering. Sturdy and simple! Makes getting to the water easy. I am able to get my 80 pound tandem Hobie Outfitter across the grass to the river even by myself. Another humanly engineered product by Hobie! Cart barely fits my 2015 Outback due to the new scupper inserts. Built very flimsy, the welds holding it together are terrible and definitely won't last. Cart would be overpriced at half of what it costs. Won't be purchasing any other carts from Hobie, ever. But just to be clear, ACK customer service is awesome and has nothing to do with my dissatisfaction with Hobie's lack of quality control. With the low water levels in California due to the drought the Hobie Plug-in Cart makes it easy for me to get my Mirage Outback down to the water to fish. It works great, but bogs down a little in loose sand. Much better than the homemade one I had been using. Mine works well, used 10 or 20 times so far no issues. You can also make this from PVC, but the Hobie version is metal and seems very durable. Will see if any issues like the previously poster had, Im sure ACK will help you out ! I bought this cart for my PA. I figured that it would be worth the price. However, after using it only 4 times the little cap/retention pin shown in the photos fell apart. Can't imagine not having the cart. My 14 ft PA is still a beast but the cart makes it manageable. There's nothing worse than carrying a heavy kayak after a long day on the water. One tip if you haul your kayak in your truck bed, insert the cart while the kayak is still in the truck bed and secure it with a strap. Then you don't have to wrestle the kayak on its side once its on the ground. Now if I can just find an easy way to insert the cart once I'm pulling it out of the water. Bought to replace a standard Hobie cart after the welds failed. This cart is much more substantial, and easier to maneuver over rough terrain. Haven't tried it in the sand, but I suspect it wouldn't be the best option there. Works great, saves your back. No reason to try after market carts, other name brands, etc. I fish out of a Hobie PA and it's pretty heavy, this cart works exceptionally well with this model, so lighter models will work even better! Solid and will handle the load you put on it. Nice ,but way to expensive.HOBIE PLEASE ! Very helpful in moving the Pro Angler 12 around. A bit over- priced. Worth every penny, makes getting the kayak & gear to the water a breeze. Great purchase... works great with our 2 Revos. The only reason I gave 4 stars is because theyre a bit pricey. Cut 6 sections of pool noodles to allow us to store upside- down in scuppers while on the water without causing drag. A bit heavy, but for unpredictable terrain and the extra sturdiness, I suppose its worth the extra weight. Overall... were very happy we got them. just received said product and have not used as of yet. Looks nice and rides nice but has not touched the ground. wish this hobie stuff were cheaper but you get what you pay for. only 4 stars because I couldnt afford the 5th! Cant beat ACK though. Best accessory ever! We took our kayak to Orca and Sucia Islands. Carted it all over and it worked great no matter what terrain we were in. You will never regret buying this Hobie cart. I should have bought this a long time ago. It makes portages so much easier. It is well constructed and easy to use. It is a little pricey for what you get. Works great, but way over priced. Good cart, However, if you anticipate using in deep loose sand you want the model with the fat tires. I strongly recommend this product after using this and several alternate carts. Other carts rusted and broke, or got flat tires that were expensive to replace, or were a nuisance to load and secure the kayak on. None of these problems are encountered with the Hobie HD Plug-in Kayak Cart; it is well designed and well constructed using quality materials. It is quick and easy to mount a Hobie kayak on the cart and the foam tires permit one to easily transport a Hobie over rough or sandy terrain, especially if the kayak is loaded with gear. As a bonus, the cart is compact and lightweight enough that it is easily stowed in or on the boat to be used for take-out at another landing point. The price is a bit high at first blush, but the construction and materials appear to be solid enough to expect extended use with limited corrosion from salt water immersion, so best to look at it as an investment in reducing the response costs of getting your boat from the car and into the water. ACK was a pleasure to do business with. The cart arrived on left coast within a couple of days of being ordered. I like the solid tires,the plastic stops doesnt fit in the scrubber holes like i thought they should. Does a good job. 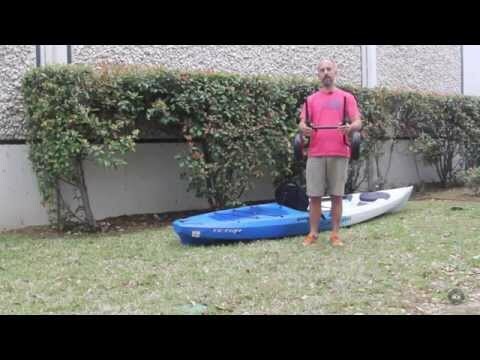 Kayak Cart-- Excellent idea saves on the shoulders-- back -- arms makes your time in the water alot more enjoyable-- They are well made --Not too sure if $145 is a fair price - -seems alittle steep!!! Works great on Western washington rocky, barnacled beaches. Much more stable than the failing/cracking PVC pipe aftermarket cart I had purchased previously, it's only been used a few times thus far but it appears to be a fantastic cart. Tires are perfect for the application. Hi Everybody this is Rudy, I just bought a new 2011 Dune White AI from ACK and had to get The Hobie Heavy Duty Plug- in Cart. These tires (FLOAT) and are foam filled so you'll never have to worry about flat tires, or adding air. The cart can be disassembled less than a minute , REALLY ! My AI weight over 110 lbs fully loaded and this cart rolls smooth and the tires show no effect. Another great thing is , no straps needed to secure just plug-in GO no time wasted....... This cart is highly recommended I give it 5 stars and 2 Thumbs up , see ya OTW. Works great with my 2 Hobie Revos. Not really worth $145 for what you get, but it does fit the Hobies really well. Would have 5 stars but mine got delivered without valve stem caps. Not a big deal at all , but for $145 ?? I purchases the HD cart but found the plastic stops would not stay in place and support the ProA. Austin and Hobie very helpful and to replace unit. Hobie Heavy Duty Plug in cart works great on barnacle covered pebbly rocky beach. Bogs down a little in sand. No air filled tires to puncture. not much to say but -good quality - i feel it's a necessity - easy to get the kayak on and off. i like that the tires aren't inflatable - one less thing i would have to deal with. it just works well - get it. Great cart ! ... My last kayak, i made a cart with PVC fittings but this one is heavy duty and high quality. I use for my AI and the knobby things that support the weight of the yak at the drain holes really helps supporting the weight and no deforming the bottom. Great tires. This cart works great. I thought the wheels would be pneumatic, but they aren't; that means they won't deflate. Not only does this plug in cart fit my Hobie kayak, it also fits my Ocean Venus 11 kayak, which was totally unexpected and an added bonus. I really like the heavy duty tires. They've gone over rocks and sand much better than the standard Hobie cart tires do. I was disappointed in the plastic supports that go on the posts. The plastic would just slide down the posts under the weight of the kayak. I tried additional tightening and it then stripped out the allen head so they must be made of pretty soft metal. I had made a PVC cart that worked well, but needed constant repair. The Hobie cart is much lighter and more durable. I sometimes transport the cart with me when on trips. Weight is everything. This cart does a great job dragging my Pro Angler around well built and very sturdy. The cart works great. It goes over the sand fairly well. Can also be installed while yak is still in the water. This is harder to do with the wider tires. Well worth the money. A: Yes! This cart will work with the standard sizing plug holes on the Hobie brand kayaks and it is very able to take the weight of both of those kayaks. Q: Can the Hobie replacement Wheels for Hobie Trax 2-30 kayak carts v2 (http://www.austinkayak.com/products/18163/Hobie-Replacement-Wheel-for-Hobie-Trax-2-30-Kayak-Carts-V2.html) fit on this cart? I already have this cart and want to know if I can get those beach wheels and interchange them. Please let me know if that is possible. Thank you! A: No, the Hobie Trax 2-30 Wheels will only work on the Trax 2-30 Hobie Kayak Cart. A: No, these will only work with Hobie kayaks. Q: Does this cart fit the Wilderness Systems Ride 115X kayak? If not, which cart do you recommend? Q: Does this cart fit the Hobie Revolution 13 foot kayak? A: It should be able to fit your kayak. Q: What is the width of the bars that fits into the holes for storage or moving the kayak? Q: I have seen one review about the 2015 outback that wasn't so favorable but how does this fit the 2015 outback and is it designed for it? A: This scupper cart has all of the capabilities necessary to accommodate the heavier Hobie kayaks. This should work well with your 2015 Outback.